JIM ANTHONY RETURNS TO PRO SE PRODUCTIONS! VOLUME TWO-RED SHAMBHALA- DEBUTS! Author Joshua Reynolds has left his mark on many characters in Genre Fiction, but one he has very nearly made his own is the classic Pulp hero, Jim Anthony, Super-Detective. Reynolds and Anthony both return for another adventure as a part of Pro Se Productions’ PULP OBSCURA imprint with THE NEW ADVENTURES OF JIM ANTHONY, SUPER-DETECTIVE VOLUME TWO: RED SHAMBHALA, now available in print and digital formats. A decades-old vendetta... A man thought long dead who might be seeking revenge... Two monstrous eagles at his beck and call... Men haunting rooftops, the skin ripped from their flesh... Rumors of stolen gold buried beneath the earth in a boxcar... And a villain so bold that he takes Jim Anthony's headquarters hostage! All this and more in RED SHAMBHALA! by Joshua Reynolds from Pro Se Productions and PULP OBSCURA! Pro Se Productions in conjunction with Altus Press presents a new volume in its PULP OBSCURA line! Originally written under the pen name of John Grange by Victor Rousseau Emmanuel, Robert Leslie Bellem, and W. T. Ballard, Jim Anthony was a "half Irish, half Indian, and all-American" adventurer who inherited great wealth and had amazing mental and physical abilities. And Now he returns in a new adventure penned by noted author Joshua Reynolds: THE NEW ADVENTURES OF JIM ANTHONY, SUPER-DETECTIVE VOLUME TWO: RED SHAMBHALA! Featuring a fantastic cover by Mike Fyles and print formatting and logo design by Sean E. Ali, RED SHAMBHALA is available now at Amazon at http://www.amazon.com/New-Adventures-Jim-Anthony-Super-Detective/dp/1517197716/ref=sr_1_2?ie=UTF8&qid=1442637845&sr=8-2&keywords=jim+anthony+shambhala and Pro Se’s own store at www.prose-press.com for 10.00. 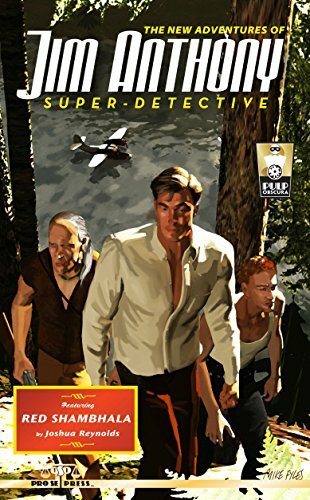 This second volume of Anthony’s Pro Se adventures is also available as an Ebook, designed and formatted by Forrest Bryant and available for only $2.99 for the Kindle at http://www.amazon.com/New-Adventures-Jim-Anthony-Super-Detective-ebook/dp/B015K8HE96/ref=sr_1_1?ie=UTF8&qid=1442637845&sr=8-1&keywords=jim+anthony+shambhala and for most digital formats via Smashwords at https://www.smashwords.com/books/view/578285. PRO SE PRODUCTIONS OPENS SUBMISSION CALL FOR JAMES R. TUCK HOLLOW EARTH ANTHOLOGY!